With sli.do you can set up a platform within just a few minutes that will enable you to communicate directly with your participants. All you need is a computer, a notebook, projector and a stable Wi-Fi connection. Your participants will be able to log on using their laptop, tablet or smartphone. Ask questions: each participant can ask a question or vote for the best question appearing in real time on an interactive wall. 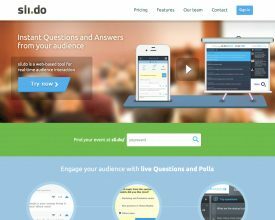 Organize polls: ask the opinion of your audience - the polls are updated live on the interactive wall. Moderate input: if you turn on the moderator function, all questions will first appear in a control panel. Here the moderator can choose the most interesting questions. You can also highlight or hide questions so that only relevant information is visible. The tool is available in 3 versions, depending on the size of your event (Enjoy is the free version, Pro and Premium are pay versions). In this 'Start-up' series we discover starters with an innovative offering that is beneficial to the event sector.